German poet, humorist and painter. For his popular satirical verses in pictures is considered one of the founders of comics. The author of popular books for kids "Max and Moritz" and "PLA and Plop", known in Russia by the transfer respectively of Constantine Ldova and Daniil Kharms. The son of a shopkeeper. He studied at the Düsseldorf art Academy, as well as in Antwerp and Munich. 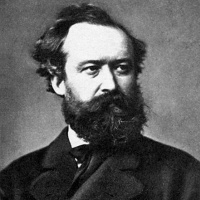 Wilhelm Busch (Busch, Wilhelm) was born 15 APR 1832 in the village of Bidental (Wiedensahl) near Hanover. He was the eldest of seven children of a small trader. Nine years the boy was raised by an uncle, pastor Georg Kleine (Georg Kleine). Subsequently, Wilhelm studied at the mechanics in Hanover, and then at the art academies in Dusseldorf, Antwerp and Munich. In Munich, he was also a member of the artistic Association 'Young Munich'. Since 1858 cartoonist Bush first published his drawings in the newspaper 'flying leaf' and later in 'Munich splint'. Popular made it humorous story 'Max and Moritz' (Max und Moritz), which appeared in 1865 and is still enjoying international success. In the works of Bush's texts and pictures complement each other. In his satirical works he ridiculed philistinism of the German and criticized the clergy, often resorting to 'black humor'. In the cartoons he first used the graphic elements to the image of the hands or feet in motion. His ideas, according to the Director of the Wilhelm Busch Museum in Hannover Hans Joachim Logroño (Hans Joachim Neyer), borrowed from Walt Disney. As an artist, he was little known, as he believed himself to be frustrated in this kind of art, and his paintings are not exhibited. About 1000 Bush paintings came to light only after his death. In Hanover Wilhelm-Busch-Museum takes place in the exhibition called 'the avant-Garde of Vicenzas'. In the paintings he used elements of expressionism, which became a revolutionary movement in art of the twentieth century. William Bush ended his poetic career at the age of 52. The last years of his life he spent in his native village, Bidental.